Exploration of stories takes many forms: fan art, fanfic, cosplay, discussions, celebrations, make-believe play, or ridiculously long essays. Sometimes the exploration is a conscious act, something actively pursued. Sometimes it’s a journey you don’t realize you had until you look back on your steps. In 2015, I was asked by the site Christ and Pop Culture to write a piece on a Star Wars film in preparation for the release of The Force Awakens. I can’t remember why exactly I chose The Phantom Menace, but I think it had to do with Jar Jar. The Gungan had been a favorite as a child, and I decided it was time to revisit. I was crafting the article in my head throughout the entirety of my rewatch, preparing to talk about the development of motion capture performances and simply how much fun I was having with the movie. I was fairly well set on what I was going to write at the end of it. It’s not an uncommon experience for children: Littlefoot’s mother, Stoick the Vast, and probably the most famous example, Mufasa. It’s that one parental figure that you, as a child, look up to and adore, and then the movie cruelly ends them. Growing up, The Phantom Menace was my Mufasa moment. As a kid, I knew that last fight sequence to the point of memorization. I knew the exact moment to look away. Qui-Gon takes Maul’s hilt to the chin, staggers, and black. My eyes were shut until I heard Obi-Wan scream, and I knew the deed was done. At 24 years of age, I did not shut my eyes. For the briefest of moments, I was 8 again. The focus of my entire article shifted in that single moment, because I realized what The Phantom Menace did for me as a child. It gave me room to explore my emotions. It taught me how to process grief. Other pieces of Star Wars media came and went over the years, some impacting me more than others. My brothers and I rewatched the Original Trilogy endlessly as children, Luke becoming more and more my favorite with each viewing. The Umbara arc of The Clone Wars was a conflagration of every emotion in existence, and I still feel personally betrayed by the fact that The Walking Dead’s Lee is also General Krell. The Force Awakens was my childhood dreams coming to life on screen, seeing at last someone like me as a protagonist. But it wasn’t until March 19th, 2017 that Star Wars hit me as strongly as it did before, when I was that little eight-year-old girl in the theaters. And of course it involved the source of my childhood trauma*. Because thank you Star Wars. *EDIT: 10/27/2018 – When I first wrote this line, it was entirely a joke. A hyperbole about the lesson of processing grief. I regret wielding that term in jest, potentially minimizing the effects childhood trauma has on people. Nevertheless, due to personal realizations caused by this very essay series, I cannot bring myself to change my original choice of words. Maul is not the source of my childhood trauma, but he did become the face of it. Left: Cover art on my Christ and Pop Culture article, by Cameron Morgan (Krop Portfolio), used with permission, 2015. Right: (Reversed) screenshot from Star Wars Rebels, “Twin Suns,” 2017. I feel personally attacked by this expression. Episode 19 of Star Wars Rebels Season 3, “Twin Suns,” set off my urge to explore like no other Star Wars media had before, not even The Phantom Menace. On one hand, my obsession was intellectually based; the more I watched, the more layers of storytelling I saw. The more details I could pull back to see how the story ticked. The craftsmanship of the episode continually impressed me the further I dug back into the Star Wars canon and Legends EU. Parallels and symbolism lived deep in the bones of the script and storyboards, and I wanted to understand the why and the how. On the other hand, I kept rewatching because there was something emotionally resonant within “Twin Suns.” As it was with The Phantom Menace, where it took me nearly two decades to realize its impact on my life, I’m not sure I’ll find out how “Twin Suns” affected me for quite a while. But that’s not going to keep me from exploring it in the meantime. After all, that’s what the best stories encourage. Were this a topical analysis, and not a scene-by-scene read, the discussion of the opening shot would be an essay all on its own. There is so much symbolism wrapped up in the titular suns, and each piece is scattered across the episode, so we’re going to take this shot and pin it up on a wall. …Maybe a wall with a little less blood. We’ll be back to this wall throughout the close read. The way the camera angle fades in on the suns and then slowly pans down to see the empty waste feels like we’re starting this episode from Maul’s literal point of view (POV), much like the opening to “Through Imperial Eyes.” The POV shot has many uses in visual media, but one that seems especially relevant here is conveying powerlessness (“Four Best Reasons to Use POV Shots,” ScreenPrism). Maul is stranded by his own doing, lost and unable to locate the one person in the galaxy he thinks will set his life right. In addition to his helplessness, this POV shot is used in the same manner as “Imperial Eyes,” which established Kallus as our audience surrogate for the episode. In “Twin Suns,” this establishes that Maul is one of our primary viewpoint characters, a method that we will be revisiting later in this analysis. I am a firm believer that any inclusion in a story must serve the story first and then symbolism or fanservice second. A shot that is given simply for the sake of symbolism without telling us something about the actual story is what leads to a lot of shallow pretenses of deeper meaning (the overuse of the “Jesus pose” is an obnoxious symptom of this). Part of what makes “Twin Suns” so perfect is that it always puts story before symbolism, thus allowing the symbolism to deepen the story. Symbolism must be in service to the story, not the other way around. This opening scene with Maul establishes “symbolism in service to the story” in both the audio and the visuals. The visuals alone work on five levels. The first level on which the visuals function is the story, as it should be. 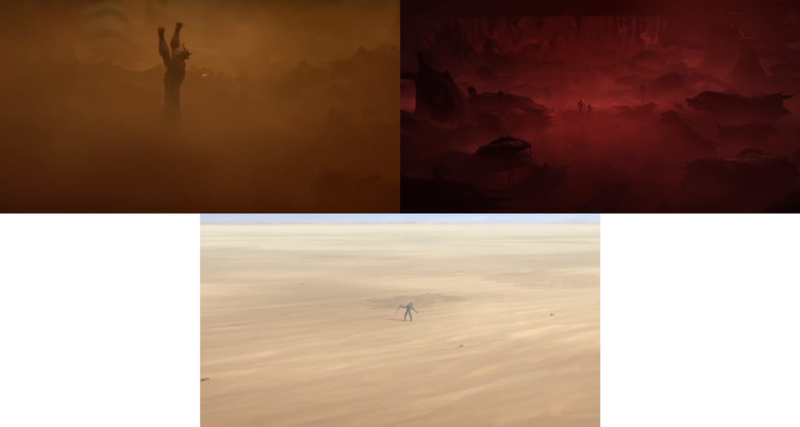 By showing us shots of lifeless wastelands and of Maul alone against a far horizon, we are shown that he is lost, that he’s not even close to finding Obi-Wan. The shots of different landscapes – hills, canyons, and barren plains – shows that Maul’s trekked a very long way, that he’s been searching for a long time. Note how the colour of the scene changes. Where every other scene was awash with colour, with blue and red and gold, everything in this scene is completely white – as if this is all happening in some kind of void. Neither Fal nor Haka actually matter. What matters about Fal? His rank. He’s the Arbiter, he’s more of a symbol than a man, and that is what the Prophet declared earlier in the episode he would use. What matters about Haka? He’s the tool through which the Prophet plays this game, a means to an end. And the whole vengeance thing again. Fal’s fate is set in stone because he is moved to face Haka personally out of revenge, but, ultimately, neither Fal nor Haka actually matter within their own story. The only thing that matters about Fal is his rank, and the only gain that is made is the Covenant’s in twisting his rank into a mark of shame. Keep an eye on this quote, we’ll be returning to it in a moment. The fifth level is a combination of both symbolism and meta in Maul’s journey. There are a number of arc words that follow Maul throughout his life. Compilation of all the times Maul says Obi-Wan’s name throughout The Clone Wars and Rebels. All this is reinforced by the emptiness of Maul’s surroundings. As the chaos of Lotho Minor was a reflection of his state in The Clone Wars episode “Brothers,” so is Tatooine here in “Twin Suns.” In fact, this emptiness has been a reoccurring theme in all the locations associated with Maul throughout Rebels, almost like a defeat tour of his life. Malachor is an abandoned, lifeless planet, one that Maul know from his time as “apprentice to the most powerful being in the galaxy.” It was once a source of power for him, fueling his desire for revenge against the Jedi (Darth Maul #1), and he returns to it during Rebels in attempt to regain that power he has lost. The abandoned outpost during “Holocrons of Fate” is a remnant of his power as the head of Death Watch and Mandalore, where he once controlled skilled warriors (Son of Dathomir #3). Now, all that he has at his beck-and-call are reprogrammed Mandalorian tourist droids. Dathomir he explicitly refers to as the source of his people’s power, particularly his mother’s, but all that’s left are ghosts, both literal in the Nightsister spirits and metaphorical in the shrines he built to his past. 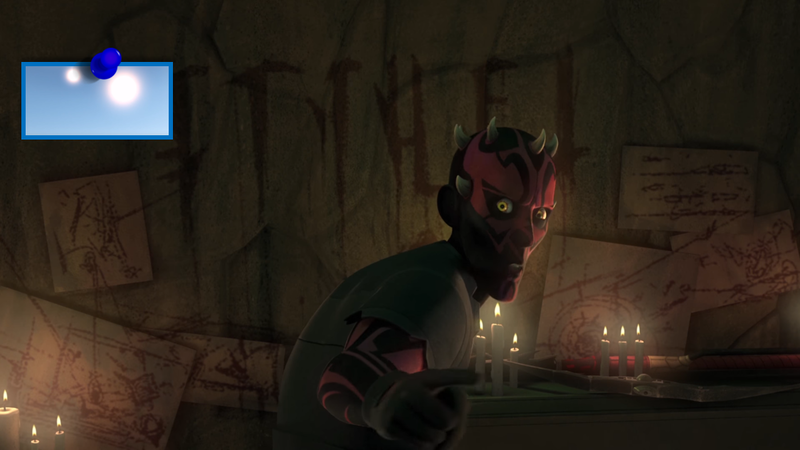 Maul has been abiding in abandoned places for the entirety of Rebels, emphasizing his own abandoned state and the emptiness that is consuming him from within. The Holocrons first give Maul an answer of “nothing! Only oblivion!” which is again echoed in his surroundings at the beginning of “Twin Suns,” but what leads him there, to the emptiness, is the second answer the Holocrons provide: Obi-Wan Kenobi. 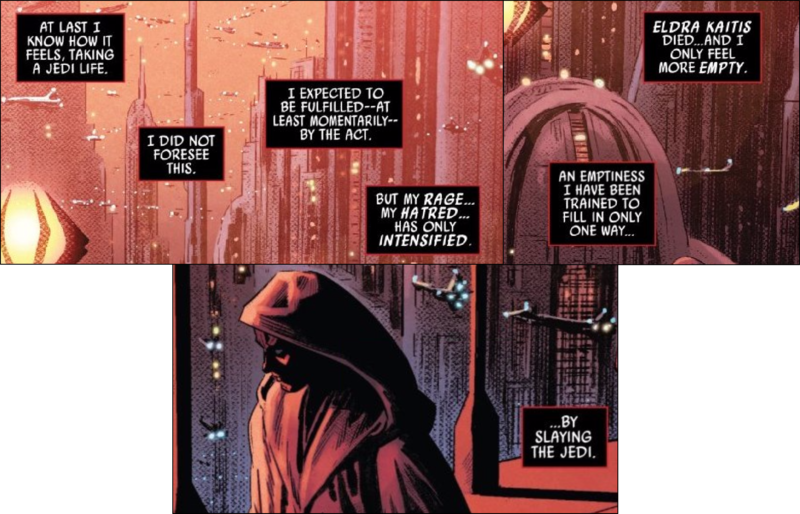 Once the Jedi is revealed to Maul, he seems to completely abandon his original question, becoming desperately Sith-like in his motivations once more. This shift in his goals, from hope back to revenge, from a Jedi way of thinking back to a Sith’s, happens on the abandoned Death Watch outpost. This outpost was the last time he saw Kenobi in-person, near the end of the Clone Wars, and it’s also where Kenobi is reintroduced to his life in the age of the Empire, through the Holocrons’ vision. The reveal of Kenobi’s survival, especially under these circumstances, could easily have triggered that old response of his. This is what appears to happen to Maul in “Holocrons of Fate.” He sees Kenobi and is immediately reminded of his past, how everything seems to take a downhill turn when the Jedi Master shows up. On Naboo, when he fell. On Florum, when he lost to Hondo Ohnaka. 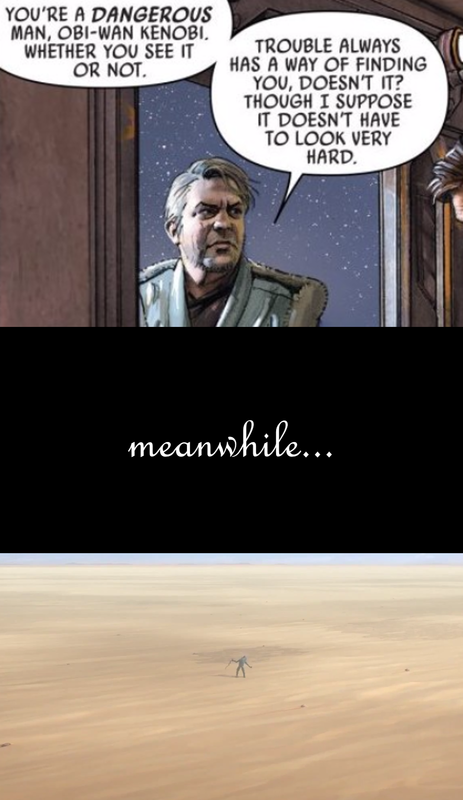 On Mandalore, where Satine’s death is almost immediately followed by Savage’s. Even on that outpost, Kenobi’s appearance precedes his mother’s death. 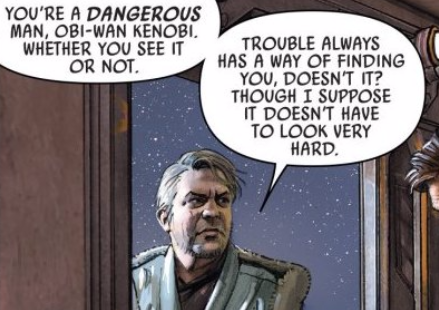 Of course, not all of these are cause-and-effect, but Kenobi does frequently arrive as at least the harbinger, if not the bearer, of Maul’s downfall. So the vision of Kenobi in the Holocrons kicks off Maul’s now-instinctual reaction to the man, and Maul reverts, in essence, to the man he was on Lotho Minor. Devoid of hope. Driven forward by one thing. “The truth is often what we make of it,” indeed. A final statement of the smallness, the near-nothingness, of Maul is how he considers Tatooine to be an echo of his old life. Two occasions we know of his visit to the desert planet, one of which was when he took control of Jabba and the Hutts, a feat of which not even the Separatists or the Republic could boast. 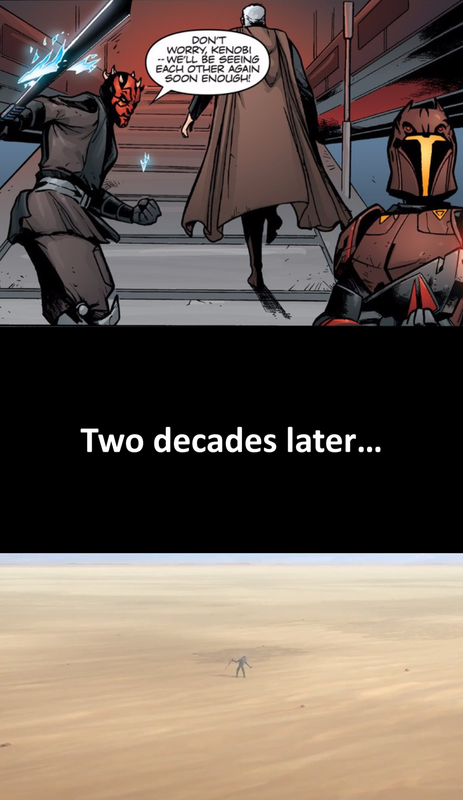 A feat that led directly to his take-over and rule of Mandalore. But this is not the occasion to which he thinks when he considers Tatooine. Of course, it is true that his fight with Qui-Gon there was the first time the Sith truly revealed themselves to the Jedi after a millennium of hiding, and it was again during the time in which Maul was still tied to the “most powerful being in the galaxy.” However, that encounter is treated both in-universe and in meta as a small blip on the radar of galactic importance. It isn’t until Maul kills Qui-Gon on Naboo and is all but killed himself that the Jedi acknowledge the reemergence of the Sith. Therefore for Maul to make such a grandiose statement – “it ends where it began!” – of an encounter that is considered so inconsequential is a demonstration of how he tries to hold up his selfish pursuit as something worthwhile and important, when in actuality it is small, almost meaningless. In light of that “nothingness” of Maul, we now return to the A.V. Club’s quote about Maul’s revived presence and actions not having a broader ripple effect on the Star Wars universe at large, at least not in how it pertains to the movies (keep in mind that the Mandalore itself has not had a visible effect in the movies). There are two responses I have for that claim. The first is to refute it. YouTuber Urban Acolyte, in his “Twin Suns” review, talked about how Maul murdering Satine ensured Obi-Wan’s commitment to the Jedi would last throughout the war. 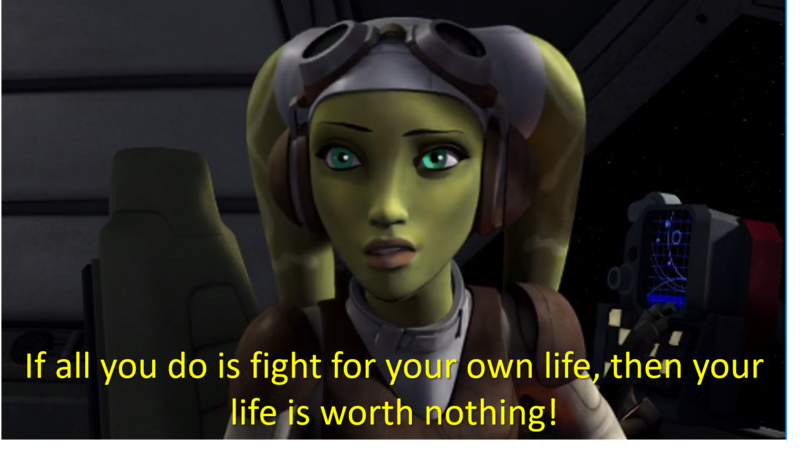 He makes this claim in the light of the line from The Clone Wars Season 2 in which Obi-Wan said that if she had but asked, he would have left the Order for her. Had Obi-Wan done so, as Urban Acolyte points out, there would be no one to protect Luke in the aftermath of Order 66. I’m not entirely sure that I agree with Urban Acolyte here, as it seemed to me that Obi-Wan and Satine had both accepted they were beyond that choice, and both respected each other’s convictions too much to ask the other to abandon them. Nevertheless, it is still a possibility, depending on one’s point of view. And if Urban Acolyte is indeed correct in his theory, that means that Maul’s return does have a weight that carries, albeit invisibly, into the movies. Consider the difference of impact between Star Trek‘s Khan Noonien Singh in The Wrath of Khan and Into Darkness. In Prime timeline (the Original Trek), Khan was established in the movie primarily as personal foe to Kirk, even to members of the audience who had not seen or remembered his introductory episode in the series. As a result, the emotional impact that Khan has on Kirk is both extreme and believable, despite the two characters never occupying the same space. In the Kelvin timeline (the Alternate or NuTrek), Khan is established primarily as a large-scale threat, and the movie waters down any potential rivalry between Khan and Kirk (or Spock), thus making the showdown between the ships or with fisticuffs lack any vibrant emotional drama. No matter how much they affect each other, Khan does not have a personal stake in what happens to Kirk or Spock; they’re just in his way. In the end, it’s not the scale of the villain’s influence that matters. It’s their effect on the lives of our heroes. Now to be clear, large-scale villains like Dooku and Palpatine can and do work, and such villains can become personal foes as well (see the dynamic of Optimus and Megatron in Transformers Animated). The main point here is that villains don’t always have to be a galactic menace in order to be a worthwhile inclusion. Full disclosure: I didn’t always think Maul was a worthwhile inclusion. My reaction to the announcement at the end of “Witches of the Mist” that Darth Maul was alive is best summed up in two quotes from the comedy recap blog Snark Wars: “I… okay Star Wars.” and “LOL. Okay Star Wars if you insist.” I was amused by the notion at best, rolling my eyes at worst. Then “Brothers” aired, which ended with a rant by Maul about Obi-Wan Kenobi, about an obsession for revenge against the Jedi, and I was hooked. I was invested because it meant something personal for my favorite character of the Prequel Era. It meant a spotlight on him. It meant emotional stakes. It meant character development. And that’s what Maul has provided ever since his revival: personal stakes, be it for Obi-Wan, Satine, Ahsoka (unaired), or Ezra. Count Dooku made an enormous impact in the shape of the overall plot that is the Skywalker Family Drama of the movies, but even though he trained Obi-Wan’s master and cut off Anakin’s arm, the personal stakes with Dooku aren’t there (outside of Ventress’ arc that is, but that’s another topic). Going toe-to-toe with Dooku isn’t an emotional task. Until murder comes into play in Revenge of the Sith, their encounters are politically and strategically motivated, the shared Jedi lineage barely being touched upon. It’s a grand scale that rarely lingers on the inter-character dynamics. In contrast, Maul’s fight against our heroes is always emotional, always personal. And that’s what makes him a potent character in the Star Wars universe. So yes, Maul’s faux-Shakespearean speech fits the smallness of his influence, but the smallness of his influence is what made his revival work in the first place. So what if he’s inconsequential in the galactic scheme of things? That’s where his impact is greatest. When writing a story that’s limited to 21 minutes, some things will get cut from the telling. On the Star Wars Celebration 2017 panel “Animated Origins and Unexpected Fates,” Lucasfilm creative executive Pablo Hidalgo and Filoni said that there were plans to have hallucinations of Savage and Duchess Satine haunt Maul during his trek through Tatooine. While I am dying to know the details of these theoretical scenes, it makes sense that they did not make it into the final product. 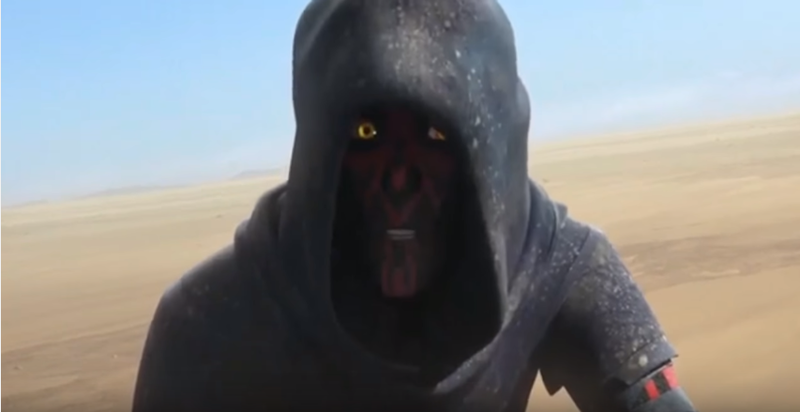 Were this a Maul-centric episode, perhaps some other things could have been sacrificed for a deeper look at Maul’s mental state. However, this is not a Maul-centric episode, at least not solely. Ultimately, “Twin Suns” is equally about Ezra, Obi-Wan, and Maul, even if Kenobi himself doesn’t truly show up until the last third, and so the ghosts from Maul’s past were rightly cut for time. Nevertheless, we still have a few ghosts echoing from The Clone Wars scattered throughout this episode, and in the soliloquy here. 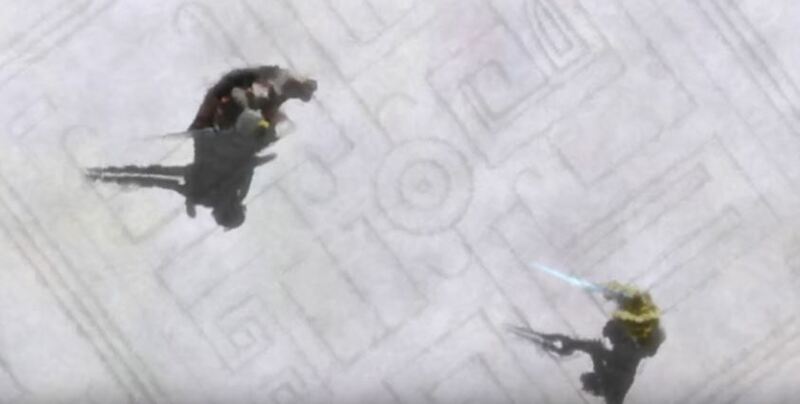 Visually, we have a callback to both “Revenge” and “Brothers” with the skyward scream. The gestures Maul makes before howling are similar on both accounts, bringing his hands to his chest before throwing them wide. However, the reasoning for his scream in “Twin Suns” is closer to that of Savage’s in “Brothers.” Both of them are unable to locate the individual that they believe will set their life right. He continues by sinking further into despair and self-pity, before pulling out of it. On Dathomir, he has Savage to prompt him, but on Tatooine, Maul must make the effort himself. 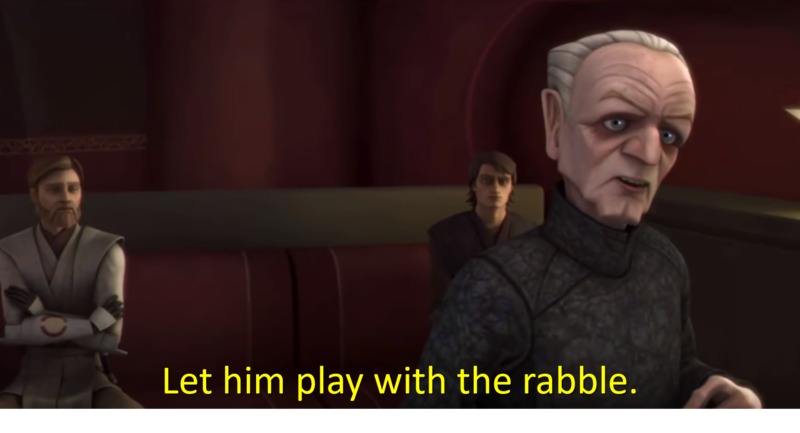 Both instances are followed by Maul targeting children to trap Kenobi, and I want to draw attention specifically to Ezra here. In “Revenge,” Maul is accompanied by Savage, who listens and responds to Maul’s thoughts, reaffirming his worth. In “Twin Suns,” as A.V. Club points out, there’s “no one around to hear–or care. So of course he called for the only person in the galaxy who would care” (A.V. Club). The silence between his lines, where Savage might have spoke, are left to linger like the space he was hoping Ezra would fill as an apprentice and as a brother. Beyond the content of Maul’s words, the inflection of one in particular also calls back to The Clone Wars. The second “No!” in his soliloquy is exactly the same as a “No!” he releases in the episode “Brothers.” This is immediately followed by a canted angle of the camera, showing that the mask Maul puts on over his obsessions is slipping, that he’s regressing or has already regressed to the state in which Savage found him on Lotho Minor. Maul’s design here is another echo of his time on Lotho Minor. 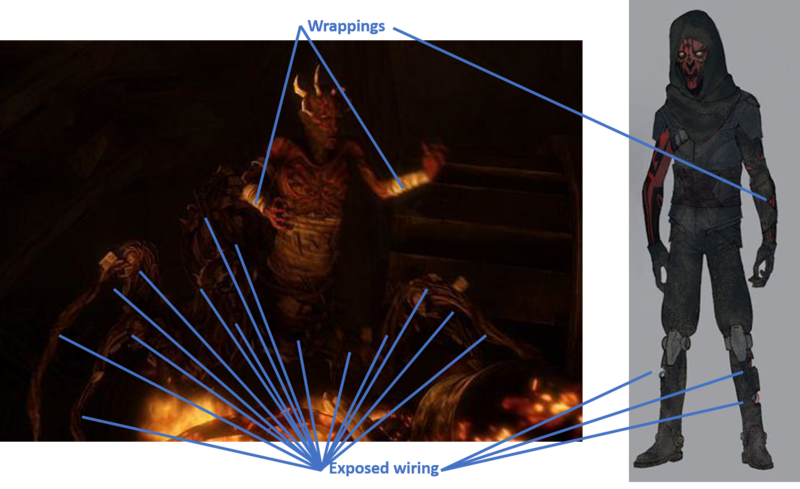 While reacquiring his hood from “Twilight of the Apprentice” gives him a silhouette similar to Obi-Wan, two details in particular bring to mind his Spider-Maul look from “Brothers.” His legs are beginning to deteriorate (another demonstration of the difficulties in navigating Tatooine), exposing wires in a manner reminiscent of the Force-locked garbage that once served as limbs. On his left arm are wrappings, something he hasn’t had since Lotho Minor. For a pre-“Twin Suns,” but nonetheless detailed and insightful analysis of Maul’s outfits, please check out the blog Poetry in Costume: The Fashion of Nemesis Part 1 & Part 2. Back on Tatooine, I wish to return to that canted camera angle, which I find very interesting, particularly in how it begins to even out as Maul continues his rant. To me, this shifting of the frame invokes two separate, but not mutually exclusive, meanings. Firstly, we see the angle flatten as Maul finds his footing in a plan. He’s no longer desperately grasping at straws; he has a way ahead of him. Thus, his mask of calm is reapplied once more. Secondly, this also seems to indicate that Maul finds anchorage in attachment. Back around when Maul was reintroduced to Rebels, Tumblr user scribbleymark wrote an analysis on how he is a sympathetic villain because he becomes emotionally attached to others (“Attachment over Guilt”). This notion of Maul’s attachments was also what set him apart from the Ultimate Evil(TM) of Star Wars: Palpatine. In the episode “The Lawless” of The Clone Wars, we see Maul mourning his brother, which Filoni and Witwer point to as a positive quality. Ultimately, that ability of Maul to emotionally attach to other individuals, even in a self-centered way, is the defining character trait that makes him sympathetic. In “Twin Suns,” the canted angle levels out as the last two emotional attachments of Maul are brought into alignment. 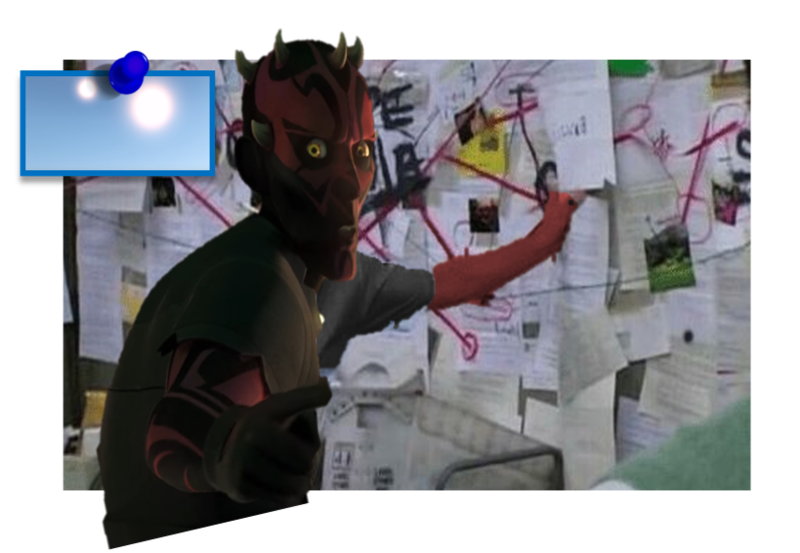 Maul has a plan to find Obi-Wan Kenobi (whose very existence has define Maul’s life for decades) and that plan involves Ezra Bridger (who Maul has been trying to take on as an apprentice since Malachor). This entry was posted in Twin Suns Close Read and tagged darth maul, dave filoni, sam witwer, science fiction, star wars, star wars rebels, star wars the clone wars, the clone wars, twin suns. Bookmark the permalink.